What could be better on Halloween than a horrifying costume? In our opinion, nothing beats the scary on All Hallows Eve, so we’ve complied a two-part list of our scariest, most fear-inducing costumes for you! This is part two of our series, so check the blog for part one to see even more frightful outfits! Ladies who aren’t afraid of a little extra baggage will love our Ghostly Lady Adult Horror Costume. This lovely, fully finished garment includes a light grey tattered full length velvet gown with zipper in back, satin & lace accents, tulle petticoat, matching hat, gloves, and wig. Gentleman beware, the Grannie Reaper is on the loose! 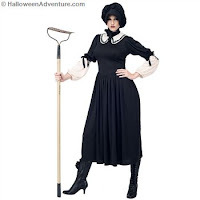 Our Grannie Reaper Adult Costume is a horror-inducing getup that includes a dress, collar, and bonnet. All clothing is, of course, in a black and white scheme. Pile your hair atop your head and carry a shovel. We’d also recommend practicing a frightful scowl. Don’t get in the car if Hemlock the Ghost Chaffeur is driving. He’s sure to drive you straight into ghost town. Our Hemlock costume includes matching grey chauffeur's jacket and pants, grey hat with black brim, and black boot tops. 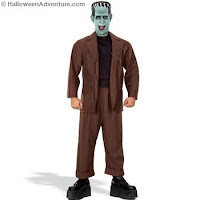 Pay homage to one of the greatest horrors of all time with our Herman Munster Adult Frankenstein Costume. 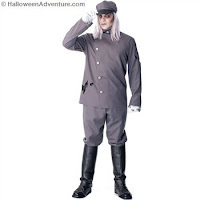 Herman costume includes a jacket with attached shirt, pants, and an EVA Herman character ½ mask. Get your friends to come as Lilly, Eddie, and Grandpa Munster (all sold separately) for a wacky & fun group costume! The scariest nightmare of all comes to life with our Jack Skellington Adult Horror Costume. This ghoulish get-up from The Nightmare Before Christmas includes jacket, ascot and bow tie. This is an officially licensed ©Disney costume. We’d highly recommend face paint. Lastly, one of our most frightening costumes includes our Jason Creature Reacher Adult Horror Costume. 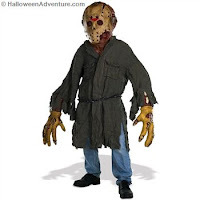 The Jason Creature Reacher costume includes: oversized deluxe latex mask imitating the classic hockey mask, foam latex arm and hand extensions, long and ragged jacket, and chain link belt. The foam latex hands move with you to give you that extra long reach. This is an officially licensed Jason™ and Friday The 13th™ product. For more horrifying costumes, check out Halloween Adventures.